Design complements safety with SentryRail handrail systems. 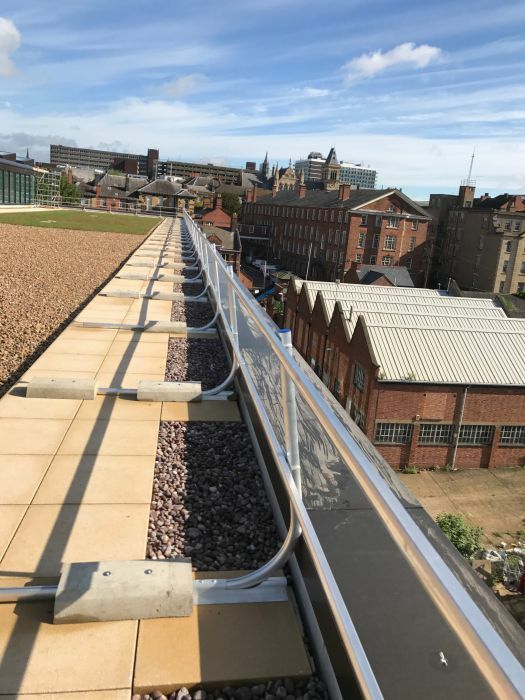 This free standing handrail system is designed from lightweight aluminium and extruded to a patented design, rakes back at a modest angle to give a safe and stylish finish to any roof area. The range includes lockable access gates for security as well as corner joints to cope with changes of direction horizontally or vertically. Finishing touches include striking blue end-inserts and PVC elbow bellows to maintain both aesthetics and style. A choice of finishes, which include natural, anodised or powder coated to a chosen RAL colour, can be selected to complement the décor.